It’s been five years since Japan’s Tohoku earthquake, tsunami, and nuclear meltdown in Fukushima—and some consumers are still wary of produce grown in the region. That’s why some farmers aren’t growing plants in soil that might be contaminated—they’re growing plants in polyester instead. 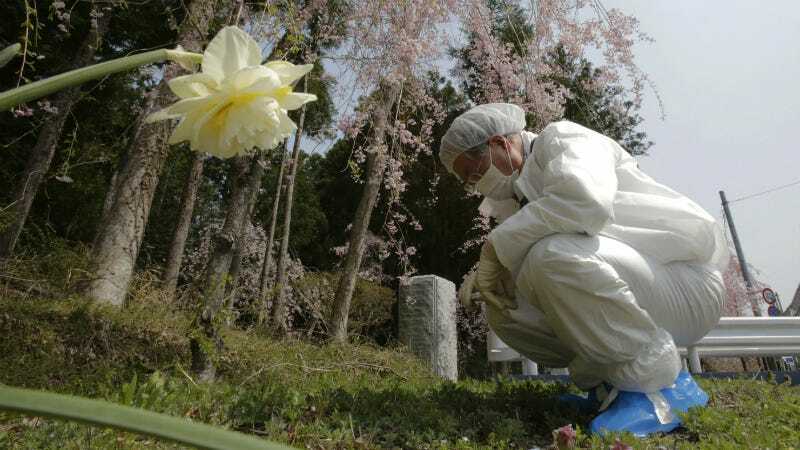 Farmers in Kawamata, a town in Fukushima prefecture that’s about 30 miles from the Daiichi plant, are using thin, polyester fibers to grow flowers, aiming to quash misconceptions that Fukushima’s agriculture is unsafe. It’s a collaboration with Kinki University in Osaka, Asahi Shimbun reports. In a trial, farmers successfully grew over 2,000 anthuriums (vibrant, heart-shaped flowers) in a greenhouse in Kawamata—a town that technically still has an evacuation order in place in one area. But swapping ground soil for this fake soil made of polyester fabrics can not only actually grow crops, but it can give worried consumers peace of mind, too. Radiation levels on Fukushima’s coast, while still elevated, have dropped significantly since 2011. Before the tsunami, Kawamata was a big agricultural town known for livestock and tobacco. Hopefully this new, artificial soil can help the area get back on its feet: Participants in the project hope to start full-scale polyester farming and shipping later this year.